Great News! 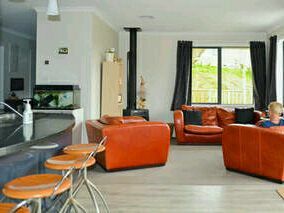 This is your ticket for a stay at Taranaki Retreat. Kia ora - Thank you for getting in touch – and for all that’s happened so far. We want to be here for you to help you through all this… please read on and find out all you need to know about coming to stay. beauty. And now – we’d love YOU to come and check it out, and check in. ...and we’d like to offer you a stay. Now’s the time to decide whether you’d like to take up this opportunity. Keep reading to see if a break at Taranaki Retreat is something you’d like to book in. ​As a Guest here, you’ll stay in the “Lodge”. It’s a cosy newly-built home. Here it is, all lit up in the evening. It has two bathrooms and bedrooms for four Guests / whanau. It’s a little like staying in a hotel with two communal lounges, a kitchen and laundry. The kitchen cupboards and fridge are full of food ready for your stay; the fish are chillin’ in their tank, and there’s an excellent movie/TV system to watch; loads of books, puzzles, art supplies and a couple of guitars. There’s also a secure computer for you to use to keep a journal of your stay. The GymCave has some great exercise equipment, powertools, and craft supplies – and is a great place for messy art. ​Also on site is a Chapel for time on your own; quiet times and reflection – things like yoga and mindfulness are offered there. During your stay, you can access great stuff like counselling; foot massage and pedicure; pilates and fitness help; even a great new look from our wonderful hairdresser. All free of charge (of course). ​Staying at the Retreat is a bit like being at Ronald McDonald House – in that people who come and stay get to hang with others who may also be facing challenging times. There’s great benefit to this – it’s good to know we’re not alone in all this – and often people find that the time just hanging out with other Guests is one of the best aspects of their stay. We all understand what it is to feel anxious or nervous about the prospect of a stay – but don’t worry – we know what’s that’s like – and we ‘get it’. You will be allowed as much of your ‘own space’ as you like, and people often spend a lot of their time just snoozing, drawing, reading, or enjoying the landscape. We won’t be filling your days with stuff to do – the whole idea is to get some down-time. So, have a think about how you can make the best use of that :) Maybe bring some craft stuff to do, or think about what woodwork you’d like to do in the GymCave. Tell me a bit more about the place? 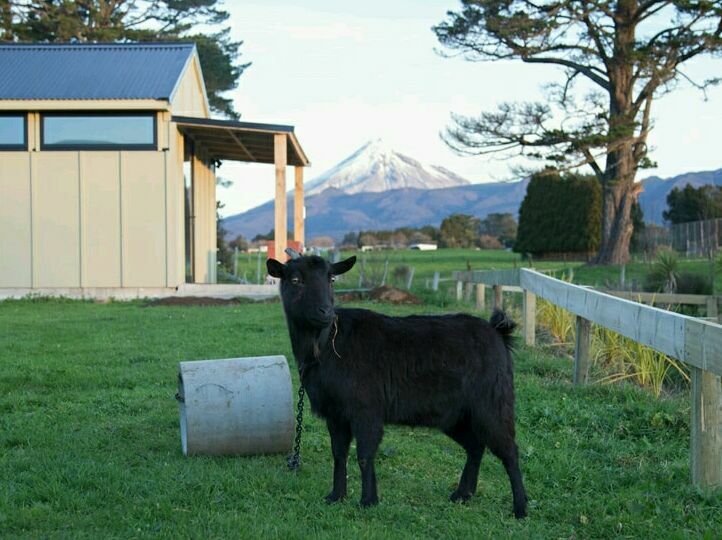 The Retreat is set on a 2.5 acre chunk of Taranaki rural landscape. ​It’s quiet, private, and in the middle of nowhere! The pets are part of our life here – and they appreciate love and feeding from all visitors. There’s chooks, ducks, dogs, goats, cats and rabbits – plus an eel or two in the waterways. The site is all organic, and there’s great birdlife to watch. There’s a Smoking Hut near the Lodge, and a house (Te Kainga) where the Retreat Family hang out. Everyone staying normally has a kai together – and one of us cooks something that (hopefully) we’ll all enjoy! There’s always a veggy alternative, and we’ll cater to your preferences. We want to feed you well. For lunch and breakfast – help yourself to the supplies in the Lodge. You may also find it helpful to know that there's a small firepit on site. Sometimes people find it helpful to be able to 'let go' of something hurtful by writing a letter, and, together with their Support Worker, letting it go up in flames. Sometimes there's some painful paperwork that can disposed of in this way. Interested in this? Please talk this over as a possibility with us now. How should I plan for my stay? Still keen? Cool. Then, at the end of this page, we’ll explain the way to let us know if you’d like to hop on our Waiting List for a stay. We’ll then contact you as soon as there’s a date free, and you can start planning and looking forward to getting some down-time and support. We understand how it can feel like a big leap – but ask yourself these questions now. If you find you can answer ‘Yes’ to all four of them, we reckon you’ll get a a huge amount out of your stay. We’ve seen it completely transform things. Q. It sounds obvious – but think about it – am I really keen for some down-time, support and care? Q. Sometimes people can feel like bailing on day two when they’re missing home and stuff like the xbox or time online. Am I the kind of person to push on through that? It may not be easy, letting everything go in order to see the wood for the trees. Q. For everyone’s well-being, this is a drug/alcohol free place. Am I cool with that? Or does it feel too much right now? If it DOES, then we really urge you to call/email and talk this through frankly, so that we can figure out how to make this work. We don’t judge anyone, here – but we are committed to doing our best for you. Q. Do I have a plan for what I most want to get out of my stay? Could I come up with one, by setting a few goals? When it comes to packing – just bring the stuff you’d take away on a break. ​Bedding and towels are provided. ​You’ll find us at 517 Hurford Road, Omata. 5Ks up the road on the left hand side. You’ll spot the low blue walls; park up and walk on through the gate, up the hill and to the house. Your Support Worker (one of our Team who will be available as a listening ear during your stay) will normally meet you when you arrive. They’ll show you round, take your bags to your room, and make sure you know what’s what. If transport is a problem, then just let us know, and we’ll help out. Like any new adventure, it usually takes people a couple of days to settle in, and to get the hang of the way of life – but when you do, you may find that things start to change – with the space to find the answers, around people who deeply care about your situation. If you'd like to stay, click yes, and we'll start working to book your date.